The 11in MacBook Air is exactly the same price as Asus' 11in contender, although with only half the RAM and SSD space. But what it lacks in these respects it makes up for in build quality – especially when it comes to the screen – and for giving you the option to have a machine running both Windows 7 and Mac OS X. The new Mac OS X Lion brings a lot of improvements and above all some nice new features: LaunchPad, Mission Control, Versions, Auto Save, Resume, Air Drop, Mac App Store, the redesigned Mail app, full screen apps and new multi-touch gestures. Couple that with a slim profile and a body that weighs next to nothing and you’ve got a $999 that may actually worth the effort. The Air was derided when it was first launched, and to some extent, rightly so. It was too slow and an example of form over function. With the 2011 refresh, Apple has managed to keep the remarkable form, but also add some internals that make this more than just a rich person's plaything. Now, the Air is an excellent day-to-day laptop, and one that we think most people will find more than adequate for their needs. Unless those needs are crunching the data that comes out of the CERN supercollider. 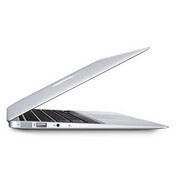 If nothing else, Intel's Ultrabook specification proves that Apple had the right idea when it first launched the Air. There is demand for these small laptops, and it's possible to build them and make them objects of desire while remaining useful. The Apple 11-inch MacBook Air is almost flawless when it comes to its build quality as well as its physical appearance and feel. Add to that the fact that Air's performance statistics trounce those of even some mainstream laptops, makes the option of buying this Mac unit all the more attractive. 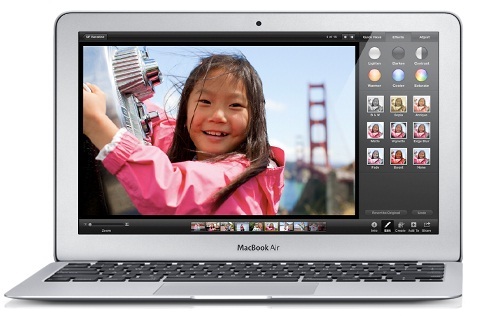 With the removal of the MacBook 13, the MacBook Air 11 is now Apple's least expensive laptop available. While the 2011 update has brought some marked improvement in performance, it doesn't address enough of the other issues to make it a great replacement for the MacBook Pro. It certainly is extremely small and light but this is not a great primary computer due to the memory and storage concerns. Although it's technically a draw, the MacBook Air wins out in key areas of performance, interface and connectivity. The laptop is definitely the better option for productivity on the move, and can be used in an office because it has excellent specifications. Those who just want to browse the internet on the move would be better suited to the iPad 2. We recommend buying a Wi-Fi-only iPad 2 and using the extra money to invest in a mobile phone contract with a generous data allowance. The tablet can be tethered to the smartphone when Wi-Fi is not available, and this will save on having to pay two separate contracts. Given the choice, V3 definitely opts for the laptop over the tablet, as it is so much more useful and is definitely worth the extra investment. WINNER- MacBook Air. We reviewed Apple's last Macbook Air just over seven months ago, but this latest version has some new hardware and the latest version of Apple's OS X operating system. The inclusion of the latest version of the operating system, OS X Lion, is the most important change, and it worked well on the Macbook Air. This is an excellent but expensive laptop, but it is a pleasure to use and looks great. Since the company has discontinued its popular white MacBook, the Apple MacBook Air 11in (Mid-2011) now stands alone as the most affordable Mac portable. At £849, you get 2GB memory and 64GB of solid-state drive; another £150 doubles both those specs to a decent 4GB and 128GB storage. Whether you’re a student or business professional, it’s a great carry-anywhere laptop with more power than we’d imagine was possible at this size, yet still providing decent battery life. We have no hesitation in recommending the 2011 11-inch MacBook Air, but before spending £1,399 on this expensively customised model, you should ask yourself if you really need the extra power and storage. If you want your Air as a convenient portable Mac to supplement to your main machine, you might be better off with an entry-level model. 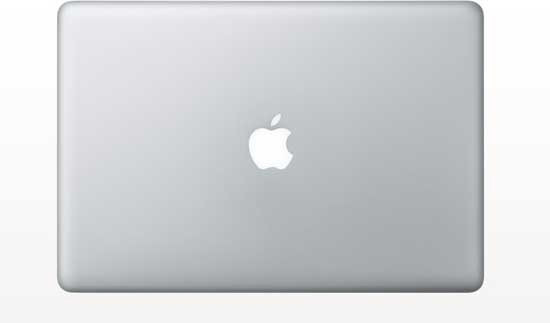 A year after the Core 2 Duo MacBook Airs, Apple has now included the Core i5 in its 11.6-inch. The MacBook Air 11.6-inch 2011 still offers a very good performance to size ratio. This ultraportable laptop continues to get more powerful but Apple hasn't redesigned the cooling system to cope with this. Plus, the connectivity is still just as lite. 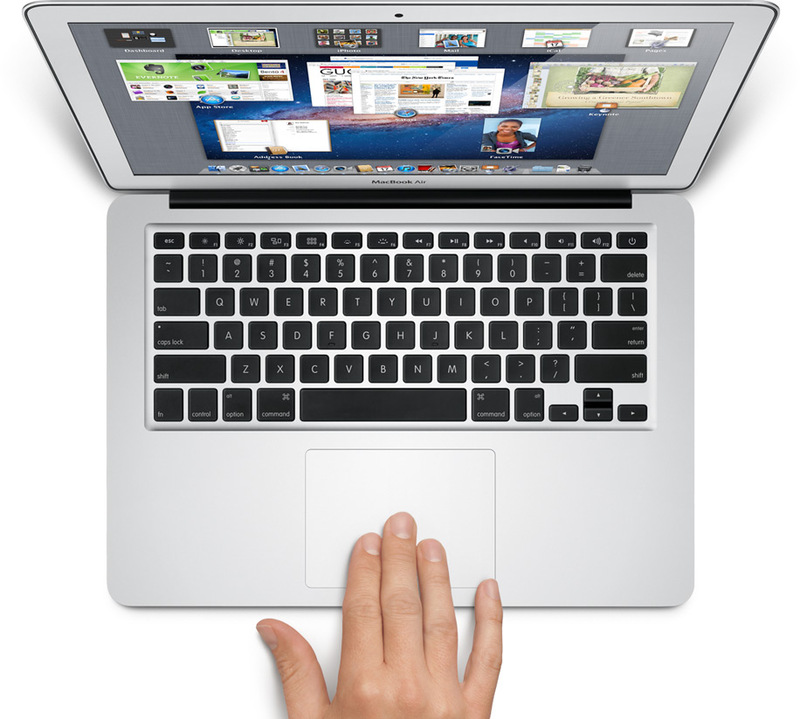 How fast is a MacBook Air when it's powered by an Intel Core i7 processor? Now that we've posted performance reports for the standard-configuration MacBook Airs, it was time to turn our attention to testing the optional, build-to-order (BTO) configurations of Apple's latest line of ultra-portable computers. Apple's dinkiest and most desirable ultraportable is also its most affordable, but is it a false economy? Alan Lu finds out in our review. When the 11.6-inch MacBook Air was originally released in 2010, the word "netbook" was bandied about, as if the Air had anything in common with these portable, but not exactly powerful, mini laptops. A strong boost in CPU power puts the MacBook Air in the performance zone of the more expensive MacBook Pro, floating it well above its ultraportable competition. And finally, for those of you lamenting the dearly departed MacBook, our test results show the new $999 MacBook Air to be much faster in our file duplication and unzipping tests, and faster in our processor tests-but as we've seen before, slower in the graphics tests. Whereas last year's MacBook Air was a good machine for light work, the 2011 models are true replacements for mainstream portable Macs. There's still no dethroning the MacBook Pro (although the 13-inch model clearly needs a higher resolution display option), but for the rest of the world there are now some excellent ultra portable options that don't force you to really compromise on performance. The Apple MacBook Air 11in (mid 2011) is clearly a machine for the well heeled, with a starting price of £850 and desirable configurations coming in over £1,000. Nonetheless, it is far from a frivolous purchase. Its styling and build are unrivalled, it has plenty enough performance for everyday computing, it'll at least half a working day on battery, and the improvements to MacOSX make it a lovely system to use. It does lack connectivity right out of the box (even eshewing the SD card slot of its 13in sibling) but, thanks to its ThunderBolt port, it can actually connect to just about anything you desire with the right adapter (once they become available). Many competitors are getting close but right now the Air is still flying high. We tallied up the total of our high-end device including the cost Thunderbolt, Ethernet, VGA, Airline Power accessories and it came to £1,513. With insurance another £200, the high-end device isn't going to be cheap. Indeed, the new MacBook Air provides an unbearable lightness of being that seamlessly marries brute computing muscle with unprecedented portability. There’s little reason to doubt that it may ultimately change our perception of what can be accomplished, technologically speaking, in small packages. So how does the Apple MacBook Air 11-inch (Thunderbolt) stack up in the category its predecessor shaped? It's certainly a fine laptop, with plenty of features you'll only get from Apple, like outstanding design, a highly refined multitouch trackpad, and OS X Lion. But you'll have to sacrifice several features that come standard on other 11-inch laptops, like all-day battery life, an Ethernet port, SD card reader, and significant storage space. 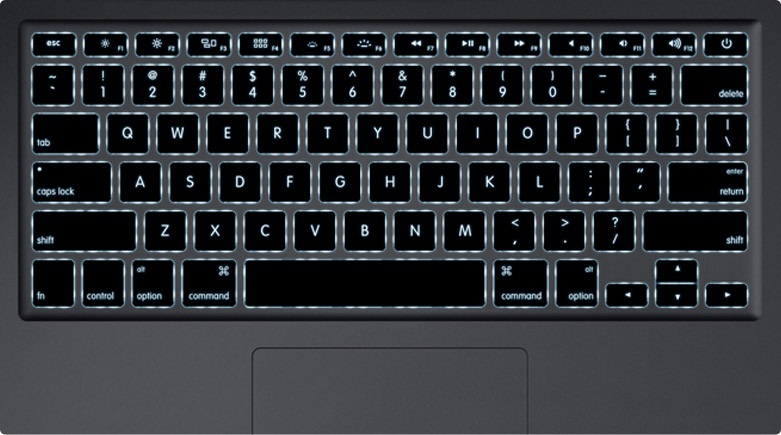 The Editors' Choice Alienware M11xr3 and Lenovo X120e provide all these features, with superior performance to boot. When judged purely on its feature set the MacBook Air 11-inch (Thunderbolt) comes up short compared with its peers. But with its light weight, striking looks, and Apple's well-deserved reputation for reliability, the MacBook Air 11-inch (Thunderbolt) presents a compelling package for Apple devotees. Last October, Apple's 11-inch MacBook Air debuted. The tiny, slim ultraportable was the smallest laptop Apple had ever made. This year's 11-inch MacBook Air improves on last year's model in several significant ways and is by far the fastest ultraportable you're likely to find, though some users will consider the limited flash storage space to be a hindrance. We're just not sure consumers want to use an 11-inch laptop as their primary computer. Frequent travelers and students would, but a few family members and co-workers said they would prefer a larger 13-inch screen. Apple offers that, too, but you'll need to spend either $1,199 for the 13-inch MacBook Pro or $1,299 for the 13-inch MacBook Air. The 11-inch MacBook Air is a very good ultraportable, but some shoppers will prefer one of Apple's other options as an everyday notebook. 82.36%: This rating should be considered to be average. This is because the proportion of notebooks which have a higher rating is approximately equal to the proportion which have a lower rating.